First off, I am NOT a purist when it comes to "organic". 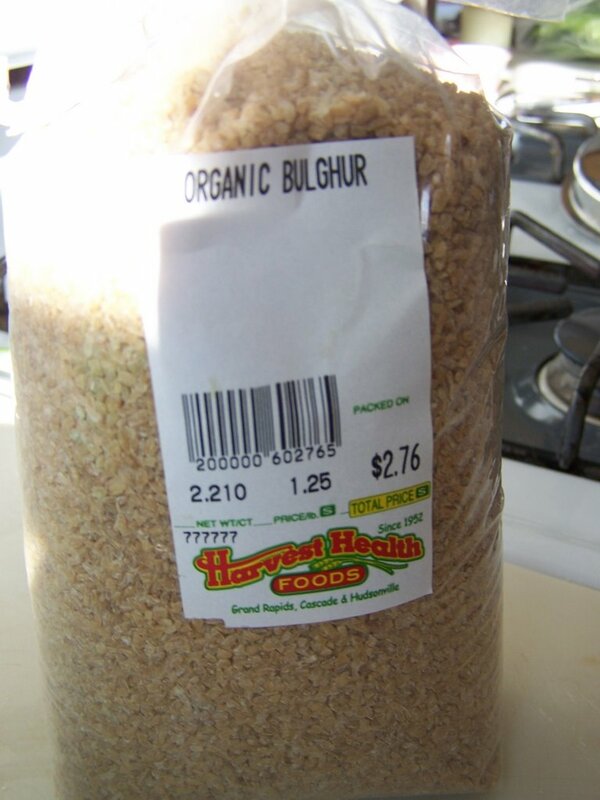 BUT...when you can get organic bulgur for only $1.25 #, then by all means, that's what I'll use. And...if you are watching what you eat after the holiday over-kill, then this salad is perfect! Usually I am drooling by the time I finish creating this, so I get a bowl and dig in. Too late for breakfast, and too early to be fixin' a hearty lunch. Typically, I would serve this along side maybe a small grilled tuna filet, or small chunk of baked salmon. 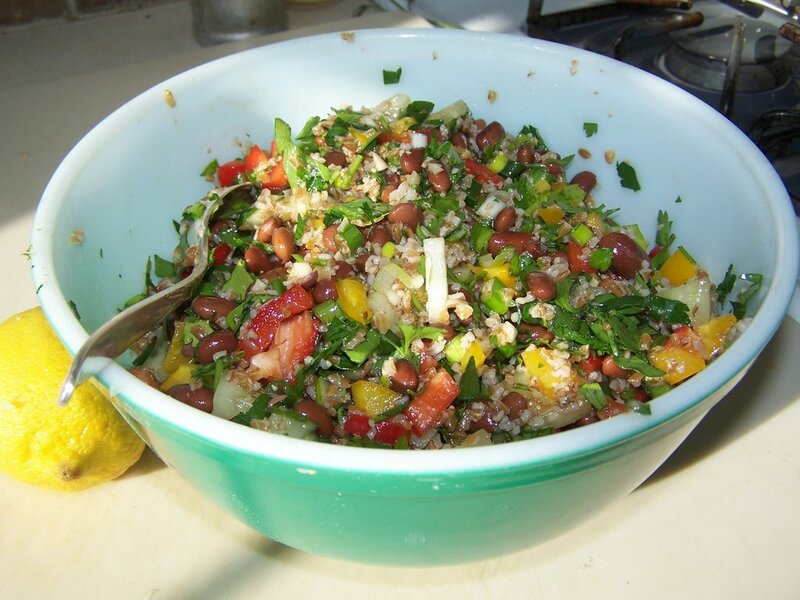 Bulgur and black bean salad. What are some of your favorite ways to slim down and cut back? Oh dear, now I'm in a bit of a quandry. I've just set a lovely pan of Cinnamon Rolls out to rise. Perhaps we'll start our lunch with a bit of healthy salad and finish it with bit of fresh bun, . . I'm so weak. This looks wonderful!! I'm just trying to drink more water and stay away from fast food and eating out. Looks great...I'm a cumin fan also! Walk in flea markets :) Well, you asked! Walk. Spend more time on myself. i'm still working on that part! will have to add this light and healthy to my collection. That sounds lovely, what a great dish! I love healthy food! Oh this looks so yummy Cyn! I love your tutorials! 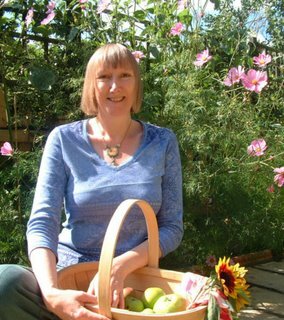 You are so inspiring...I drink tons of water...walk and clean more...and eat fresh anything...I have read some good stuff about almonds...I am going to start some greens in my greenhouse next month for salads! I love beans...in anything! Wish I could grow black and pinto beans... 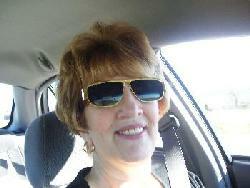 Thank you sweetie for your prayers and love and support this weekend...You and Joy are my true blue farmeresses! Jesus ROCKS! 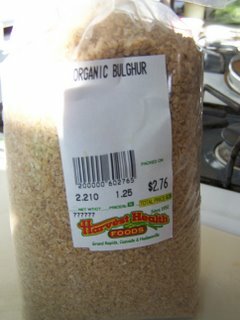 Well, now...I DO eat very healthy but still fight the "battle" every day...I guess "if it's not in the house you won't eat it" adage is still true...as far as bulgar is concerned, I'm a health food store geek, cuz I DO NOT know what it is...and to me, well lets' just say that flatbreads and a slice of cheese sounds a whole lot more desirable. I am goin have to try this! looks delish and my hubby would love it! This sounds really good! Reminds me of a similar recipe I love with black beans. Thanks for the recipe. MMMmmmm, I love any type of salad with beans! Such good protein there! I try and eat a salad for lunch every day. Even though I have yet to lose a pound, I do feel better. Yes, and lots and lots of water! Beans and franks when the budget is tight!